The Hart Scott Rodino (HSR) Act and Rules require that parties to certain mergers and acquisitions submit premerger notification filings and wait before consummating the transaction. Parties must often balance the HSR filing requirement with a number of other regulatory requirements, as well as any conditions to closing. When planning an acquisition or merger, practitioners should pay attention to the specific timing parameters in the HSR Act, 15 USC 18a, and Rules, 16 CFR Parts 801-803. Here are a few frequently asked questions about how the HSR requirements could affect timing. For most transactions, the HSR waiting period begins when both the FTC and Department of Justice receive complete HSR filings from both the buyer and seller (exception: for § 801.30 transactions, only the buyer's filing must be received). Filings must be delivered to the FTC's Premerger Notification Office and the DOJ's Office of Operations, Premerger Unit, and received before the close of business at 5:00pm Eastern Time. When submitting filings in person, parties should factor in the time necessary to clear building security screening at each agency, which can take as long as 15 minutes. If a filing is not complete, it may be subject to a "bounce" – meaning the start of the waiting period will be delayed until the deficiencies in the filing are corrected. For example, a delay in payment of the filing fee or failure to provide accurate and complete Item 5 information will likely result in a bounce. For most filings, the waiting period is 30 days (15 days for cash tender offers and 11 USC § 363 bankruptcies), and expires at 11:59pm ET on the last day. Day One of the waiting period will be the day after the agencies receive the complete HSR filings. If the last day (30th or 15th) falls on a federal holiday or weekend, then the end of the waiting period will be extended to 11:59pm ET of the next business day. If the waiting period expires without either agency issuing a request for additional information (Second Request), the parties have met their HSR filing obligation and can consummate the transaction. The agencies will not send a letter or notice that the waiting period has ended. Rather than waiting for the full waiting period to run, the parties also may request early termination of the waiting period. A party may request ET in the HSR filing or, after filing, while the waiting period is still open, by sending hard-copy letters to both agencies making a request for ET. Similarly, parties may rescind a request for ET by sending hard-copy letters to both agencies. Parties should understand that both agencies must agree to grant ET, and that there can be timing differences in how quickly each agency is able to review a filing. ET may be granted at any time during the waiting period, or not at all. Parties should not count on ET being granted, and should manage their deadlines accordingly. ET grants are effective as soon as the PNO informs either party, which is typically done via an emailed letter. What is the "withdraw and refile" process? The withdraw and refile process allows the acquiring person to withdraw its HSR filing and refile again without paying a new filing fee. This benefits both the filing parties and the agencies by providing an additional 30 (or 15) day waiting period for the agencies to review the transaction without issuing a Second Request. Under this process, the acquiring person may withdraw its HSR filing within the original 30 (or 15) day waiting period, and then submit the filing again – "refile" – within two business days, without incurring the cost of an additional filing fee. The refile will trigger the start of a new 30 (or 15) day waiting period. The withdraw and refile process is only available one time to the acquiring party, and only if the proposed acquisition does not change in any material way (see this Tip Sheet for more guidance). This process is not available after the waiting period has expired or early termination has been granted, or once a Second Request has issued. For more information about the withdraw and refile process, read our June 30, 2014 blog post, "Running Time." 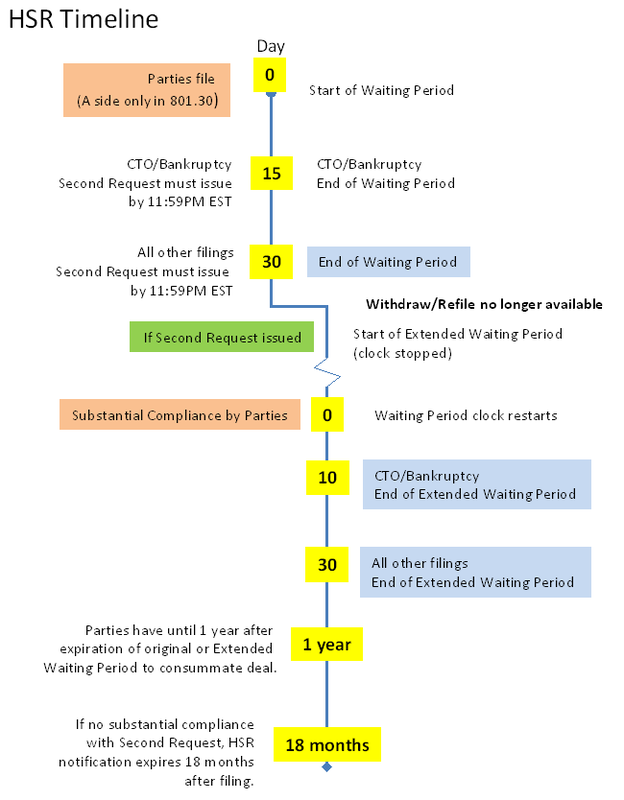 What is the waiting period if a Second Request is issued? Prior to the expiration of the 30 (or 15) day waiting period, one of the agencies may issue a Second Request. Typically, this happens before 5PM EST on the last day of the waiting period. A Second Request stops the waiting period until both parties substantially comply with the Second Request. Once the parties submit valid certifications of substantial compliance, the waiting period will then end 30 days (or 10 days for cash tender offers and 11 USC § 363 bankruptcies) after the date of substantial compliance. It is important to note that certifying substantial compliance triggers the start of the extended waiting period. Parties often enter into timing agreements when one of the agencies investigates a transaction. Timing agreements typically include a commitment from the parties not to close the transaction before a certain date or event. Timing agreements do not extend or otherwise toll the waiting period provided by the HSR Act. If consummation is delayed, how long is an HSR filing valid? If a Second Request was not issued, the filing will expire one year after the date on which ET was granted or the waiting period expired. If a Second Request was issued and the parties certified substantial compliance, the HSR filing will expire one year after the end of the extended waiting period that was triggered by the certification of substantial compliance. If a Second Request was issued but the parties never certified substantial compliance, the HSR filing will expire 18 months after the date on which the HSR filings were submitted to the agencies. If the HSR notification expires and the filed-for threshold has not been crossed, the parties must submit a new HSR filing – including any new 4(c) and 4(d) documents – and will be subject to a new transaction number, new fee, and a new waiting period, if they wish to proceed with the transaction. As with waiting periods, timing agreements cannot toll the one-year or 18-month periods. If you have questions about HSR filings, the Rules, or Act, contact the PNO. So if devices are compromised is there another solution? Does the CFTC ,SEC , FTC, communicate with postal services ?